i never really paid attention to the process of cooking until i watched the movie entitled "like water for chocolate." in this movie, the main character's thoughts and emotions (whether it was love, anger, fear, or sadness) get infused into whatever food she made. the lesson for me is that we should give importance not only to "physical ingredients" but to "emotional components" as well. and i guess this lesson applies to everything we do, in and out of the kitchen. sometime ago, i used to work as a school counselor-psychiatrist for the Center for Culinary Arts (CCA) and also the De La Salle-College of St. Benilde (DLS-CSB) which has a culinary arts program. since these are schools of international caliber, the students are constantly hard-pressed to do their best- all the time! with all the stress they experience, the students' stomachs probably produce cauldrons of gastric acid that could be used for marinating their food. because of the recent boom in the culinary arts, i have been getting more clients that are culinary arts students. well, just to be able to relate to their experiences, i decided a few years back to experience culinary arts training for myself. 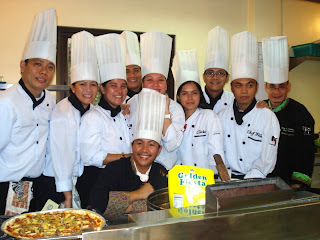 after much research, i decided to enroll at CLICKS Culinary Learning Institute (www.clicksgma.com/home) since the school offered short-term, relatively affordable, comprehensive, and TESDA-accredited programs. 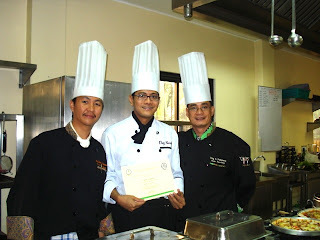 chef rey feliciano, the training director and school owner, along with chef froy flores, served as our instructors. chef rey and chef froy taught our classes with so much encouragement, patience, and fun while simultaneously teaching us the detailed knowledge, attitudes, and skills to reach our full potential as chefs. it was also inspiring to hear personal stories from their trail-blazing careers as chefs. cooking is a magical, transformative, and creative process. it is emotionally rewarding to create a delectable work of art from raw solitary ingredients. and it is even more emotionally satisfying to see others relish the fruit of your loving efforts. i hope you savor the food for thought i've offered you. sir, i'm taking up culinary arts at csb. i don't know if it's meant for me..